As ActiveHistory.ca regulars know, comic book writers and artists sometimes find inspiration in history (see posts by Mosby, McCracken, and Carlton). This is certainly true of the First World War, which has offered material for interpretation in this artistic medium just as it has in poetry, fiction, or film. And it did so right away. Comics interpreted wartime experience during and soon after the war, alongside poetry, prose, fine arts, theatre and film. Tim Cook’s research into Canadian soldiers’ culture shows that comic illustration was an important aspect of the trench journals produced by some battalions during the war. (See his “Anti-Heroes of the Canadian Expeditionary Force,” in the Journal of the Canadian Historical Association.) Veterans’ publications included comics about soldier (and returned soldier) experience too. 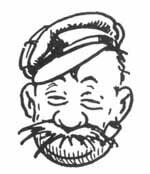 Probably the most popular comic character to come from the war was Old Bill, a working-class British Army veteran who survived the dangers of the front and put up with the ignominies of life as a private soldier. Creator Bruce Bairnsfeather, who survived frontline service in the British Expeditionary Force, introduced the character in the pages of The Bystander magazine in 1914. Old Bill’s popularity supported book publications of the cartoon during the war, a postwar play, and a film based on the play. Today, one is likely to find that comic art, and especially graphic novels have truly come of age, earning mass appreciation as well as scholarly scrutiny. With the centennial upon us, booksellers and publishers are rediscovering earlier comic art by such legends as Jacques Tardi, whose works will reach a new and eager audience now that they are being reissued. Foyles Bookshop, one of the great booksellers in London UK, for instance, has filled a wall with graphic novels and comics, seemingly to introduce a younger audience to the First World War. Alongside scheduled new editions of Tardi’s and other classics are new efforts by contemporary artists. One such book, an anthology titled Above the Dreamless Dead, attempts to capture the broad spectrum of comic art, from the traditional styles of Bairnsfather’s Old Bill to the more contemporary styles of recent graphic novels. Interested historians may also recognize that many of the styles can be found in the classical and avant-garde art of the war and immediate post-war years, interestingly and effectively blurring the lines of “high” and “pop” (or, derogatorily, “low”) culture. Above the Dreamless Dead has recently been reviewed by our friends at Ad Astra Comix who are interested, according to their web site and reviewer Nicole Marie Burton, in “politically charged graphic words.” Nicole, herself, is an anti-war activist and servicepersons’ rights organizer. She has her first historical graphic novel scheduled for release in the coming year about the 1935 Corbin miners’ strike in British Columbia, one of many bloody instances of labour unrest during the Great Depression. It would seem to us, given the connection between the stock market crash of 1929 and the First World War, that Nicole’s own interests dovetail nicely with the Great War. We invite readers to read her review of Above the Dreamless Dead (with images and links to additional materials).